The National Park Service takes their resource stewardship very, very seriously and reminds visitors through ample signage not to remove or tamper with any objects, animals, or property. So I owe the NPS an apology because I inadvertently removed approximately a pound of sand from the park. Some of which was in my short pockets, which was interesting (wind?). 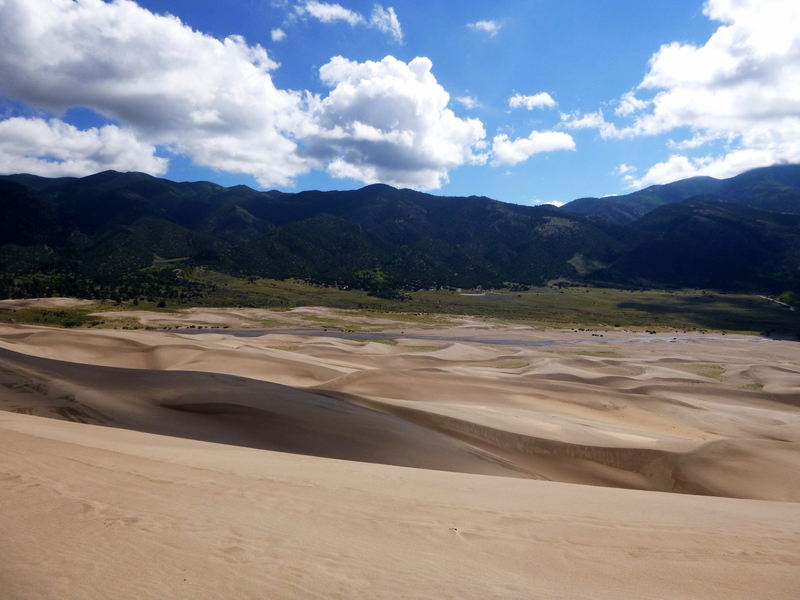 The Great Sand Dunes rise to nearly 700 feet, seemingly out of nowhere. 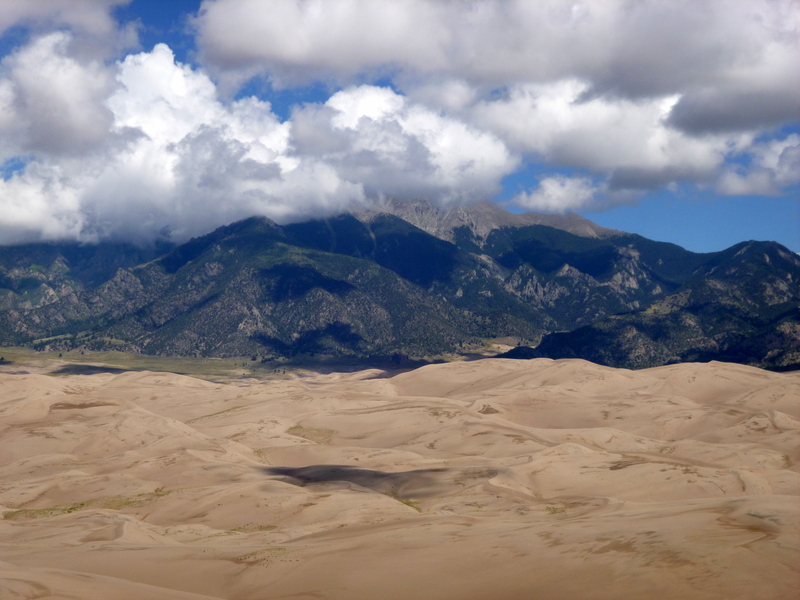 The tallest in North America, the dunes are constantly being created by the erosion of the mountains into sand, which is carried downhill and then blown back by prevailing winds upon the existing dunes. 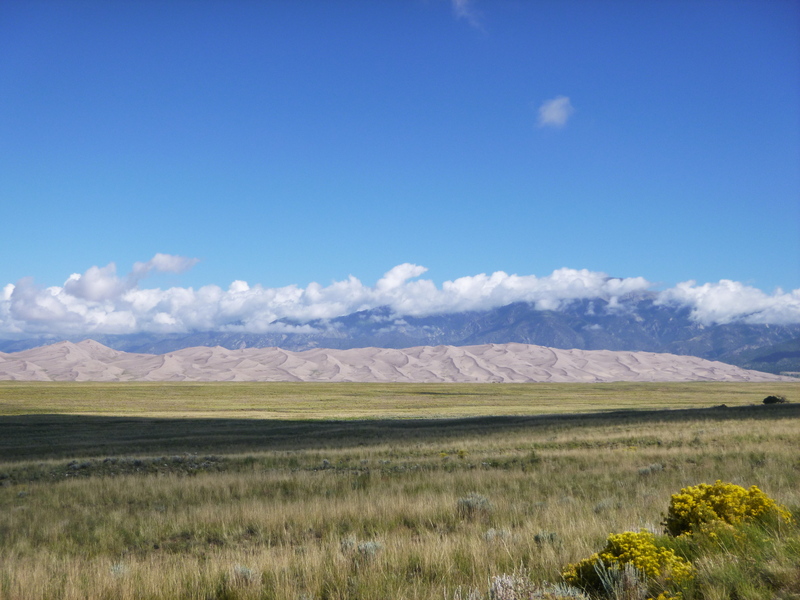 As I approached the park boundary driving across flat high desert plain I could see the distant Sangre de Christo Mountains shrouded in blue haze. 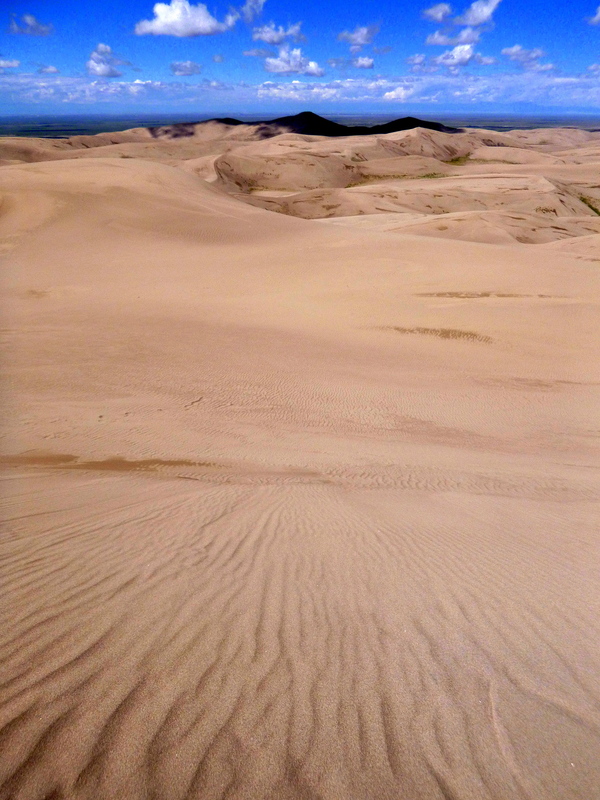 And then I crested a rise and all of the sudden I was looking at the familiar sculpted profile of sand dunes. Amazing. 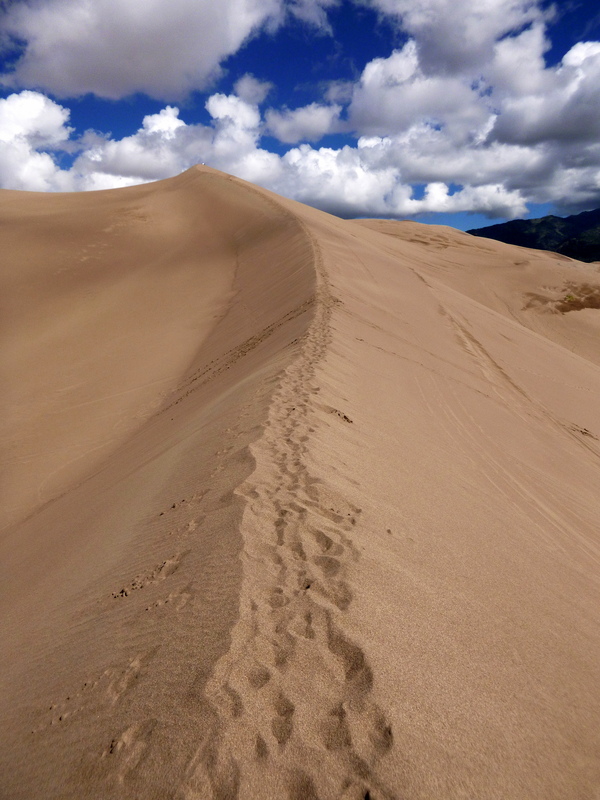 The dunes are there to explore since, without stable ground, there is no way to mark the trail. 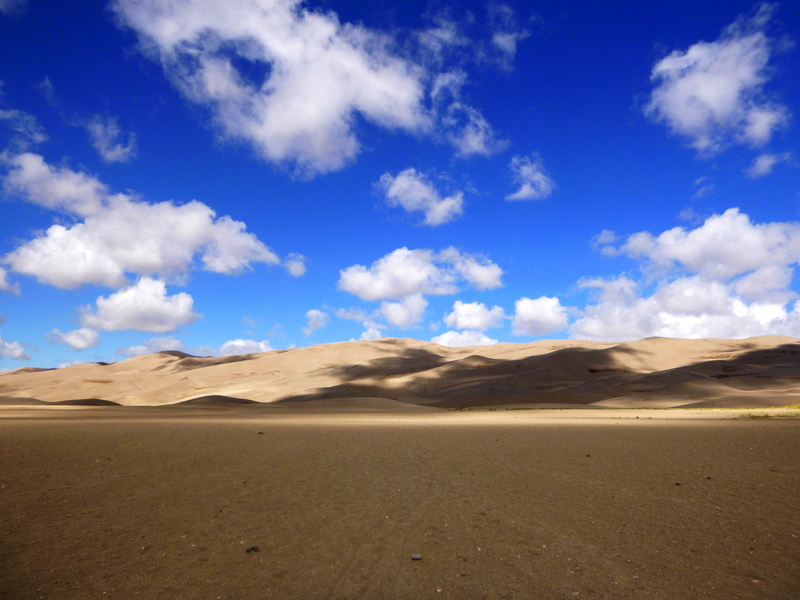 They are constantly shifting in form, but some named dunes stand mostly unchanged; these are generally the tallest ones that people climb. 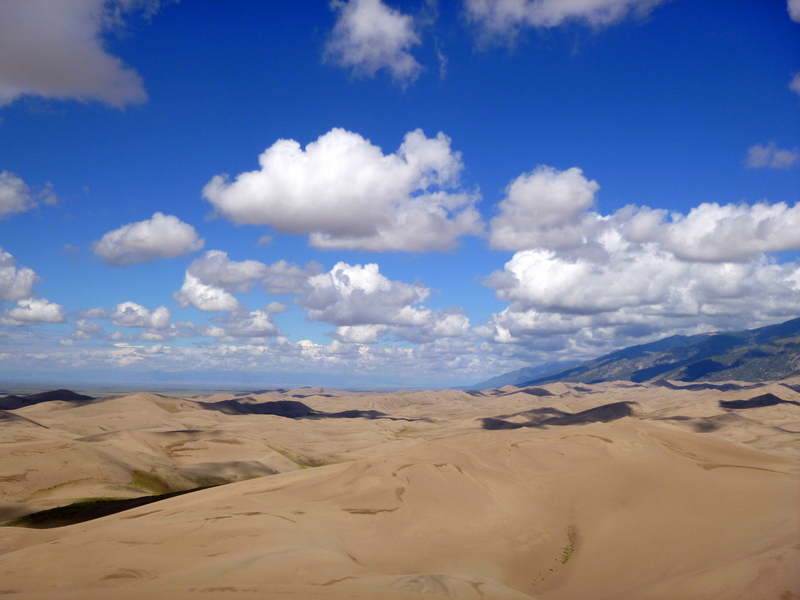 Wanting to get the best views, I headed towards High Dune, a 650 foot climb, but choose to follow (mostly) different ridge lines there and back to have some solitude. Many people both young and old were carrying sleds and modified snowboards on their hikes which looked like a fun way to descend. Climbing up 650 in sand though is not the easiest thing so I was happy not to have to carry anything other than myself and some water. Did you also get busted for putting the desert goat in your trunk? That’s crazy about how big they are! That first photo is awesome- seeing them from the road. I was cracking up reading about the sand everywhere! I bet it was a mess!